OWAIN Glyndwr fought against the invading “mailed Norman fist”. The city of Liverpool faced the wrath of campaigners after the valley of Tryweryn was drowned to build a reservoir, displacing the Welsh-speaking community of Capel Celyn. In 1980 Gwynfor Evans threatened to go on hunger strike if the Conservative Government of Margaret Thatcher didn’t honour its commitment to provide a Welsh-language TV service. Now a housing row in Carmarthenshire is the latest round in a fight by campaigners wanting to protect the remaining Welsh-speaking strongholds. Carmarthenshire council’s local development plan (LDP) includes proposals to build 11,600 homes in the area and include the creation of more than 1,000 new homes on the western outskirts of Carmarthen. Welsh-language campaign group Cymdeithas yr Iaith Gymraeg has been encouraging members and supporters to respond to the council’s consultation by objecting to the proposals. Sioned Elin, Carmarthenshire chair of Cymdeithas yr Iaith, said: “This development is completely unsuitable for Carmarthenshire. The plan is not based on thorough research or local need, but rather on outdated data. “There is no local need for these homes. The fallout in Carmarthenshire is one example of a wider argument which has been brewing for some time surrounding the issue of LDPs. LDPs outline the amount and location of new development within a local authority area and span a 15-year period. Many local authorities in Wales are now in the process of moving from the old version of these plans, called UDPs (Unitary Development Plans), to the new LDP documents. But a number of groups and individuals have come together to campaign under the Deffro’r Ddraig banner, a group which aims is to challenge the current housing situation in Wales and in particular new LDP documents. A spokesman for the group said: “In terms of housing development, local authorities receive a set of figures from the Welsh Government which outline what they are expected to deliver over their LDP period. “These are called population projections, these figures are then used to calculate the level of future housing provision in the county. “The formula is heavily based on levels of past in-migration and is also calculated using a ratio between births and deaths. The spokesman added: “The use of this formula has already led to massive over-development in many areas of Wales over the last decade or so. “A period of unusually high levels of development is then carried forward to predict future growth levels. “Areas such as Wrexham, for instance, have already seen the impact of this type of planning. Thousands of houses have been built which have been unaffordable to the local population. “Local authority reports acknowledge that the over-provision of housing has attracted high levels of in-migration into the area, predominantly from the north west of England. “Like a self-fulfilling prophecy, more houses are then planned for and built to accommodate ‘predicted’ levels of future demand based on previous completion rates. Welsh identity is an issue that has been monitored by local authorities since 2001. Recent Labour Force Survey figures have shown a decline in the number of people who identify with being Welsh in many counties across Wales. In 2001, for example, 67% of people in Wrexham identified with being Welsh, by 2009 that figure had dropped to 60%. Gwynedd has dropped from 71% in 2001 to 65% in 2009. The level of development for each county will be affected by location and very often proximity to the border; although at this stage most areas of Wales are now feeling the effects of it. The latest set of population projections predict a further 212,000 houses for the country over the next 12 years. By 2033, the projections state a further increase to 323,000. To put this into perspective, in housing terms over the next 20 years this means an extra two cities the size of Cardiff plus a town the size of Wrexham. Carrie Harper, a Plaid Cymru councillor in Wrexham and a member of the council’s planning committee and planning policy panel, argues we are seeing the implementation of policies and strategies more damaging to Welsh identity than any that have gone before. She said: “Our planning system in Wales uses a formula to calculate future housing provision. “Rather than being based on the local need of the area or taking into account issues such as affordability, a large element of this housing formula (50%) is in fact based on past levels of in-migration from neighbouring English counties. “The result of using this formula is clear to see, in the North East of the country in particular. One current example of the use of this formula are plans by Denbighshire council to build a new village in Bodelwyddan. Planners intend to more than double the size of the existing village with an additional 1,700 houses. Llyr Huws Gruffydd, Plaid Cymru AM for North Wales, added: “There’s an intention to build 200 new houses in Llanfairfechan, 800 in Abergele and 140 in Penyffordd. “Across the length and breadth of the North, the Welsh Government is trying to force more and more houses on our local councils. The new Localism Bill announced by the Westminster Conservative-Liberal Democrat coalition will spell the end for regional spatial strategies such as the West Cheshire plan. However, the damage has already been done with the majority of the houses planned in North East Wales now having either been built or already having valid planning permissions. Carrie Harper added: “There can be no doubt that the people of Wales are suffering because of policies dictating that we must cater for the housing wants of another, wealthier country. Stroll around Carmarthen market and it quickly becomes clear how important the Welsh language is in this historic town. A young woman is discussing the price of lamb with a butcher in animated Welsh while a teenager in a hoodie is in the bookshop choosing a greetings card in the same language. At the cafe’s busy tables there is little evidence of any English at all being spoken. But language campaigners and many Welsh-speaking residents are warning such vibrancy could be lost if proposals to build thousands of new homes in Carmarthenshire go ahead. The county council’s local development plan makes the case that projected increases in population mean more than 11,000 new homes are needed in this corner of south-west Wales, including 1,200 on the edge of Carmarthen. The fear among many proud locals is that the majority of the people moving in will not speak Welsh, a change that would pose a “huge threat” to the language. Carmarthen has a wonderfully rich history. It claims to be the oldest town in Wales and the birthplace of Merlin (Myrddin in Welsh), the legendary Welsh prophet and wizard. The Romans and Normans built fortifications here and the Black Book of Carmarthen, a collection of poetry, is one of the earliest surviving manuscripts written solely in Welsh. Just over 50% of the county’s population speak Welsh. In the 1980s there was an influx of people looking to break away from English and Welsh cities, but they tended to be younger people with families who, if anything, gave the language a boost because they put children into the local schools, where they learnt Welsh. The fear is that the next wave of new arrivals will be older people, retiring to Carmarthenshire, attracted by the relatively low property prices and the proximity of lovely countryside and beaches. But, it is felt, many of them will not bother to learn the language. Sioned Elin, the Carmarthenshire chair of the Welsh language campaign group Cymdeithas yr Iaith Gymraeg, called for the south-west Wales development to be scrapped, claiming no thorough assessments had been made on the impact of housing developments on the language. “Such assessments would have almost certainly shown a huge threat,” she said. Cymdeithas yr Iaith Gymraeg says what is happening in Carmarthenshire is just one example of a “national crisis”. Similar protests against developments are taking place in other areas, including Denbighshire in north-east Wales, where councillors have approved proposals for thousands of new homes. The fear there is that they will be grabbed by commuters from Cheshire and Liverpool. The Plaid Cymru MEP Jill Evans has raised her concerns with the European Parliament about the Denbighshire plans and is backing the launch of a national movement – calling itself Waking the Dragon – against such developments. Over the summer, the Welsh assembly government has consulted over new proposals to specify how the language issue should be factored into the local planning process. It accepts the impact of “demographic change” ought to be taken into account. The results of the consultation are being analysed and assembly members are expected to examine them in the autumn. In its development plan, Carmarthenshire insists that any proposals will have to take the language issue into account. Developers, for example, will have to submit a “linguistic impact assessment or statement” as part of planning applications. If problems are anticipated, “mitigation measures” such as making sure a number of homes are affordable to local people or providing “support for the language within the community” should be established. But the plan says that it has to identify new sites for housing and businesses for the good of Carmarthenshire. Clive Scourfield, the county council’s executive board member for regeneration, accepted it was inevitable that many people arriving in the area would not speak Welsh. He urged communities to encourage newcomers to learn the language. • Welsh is a Celtic language, closely related to Cornish and Breton. 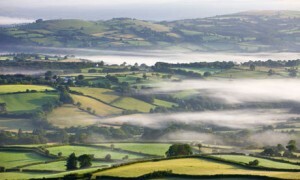 The Welsh spoken today is directly descended from the language of the sixth century. • The passing of the 1536 and 1542 Acts of Union made English the language of law and administration of government. Although the Welsh language was not banned, it lost its status and centuries of steady linguistic decline followed. • Until the mid-19th century, the majority of the Welsh population could speak Welsh – more than 80%. • The 2001 census showed that 20.8% of the population was able to speak Welsh (582,400 people), an increase compared to the 1991 census (18.7%). • Welsh-speaking heartlands include Carmarthenshire in the south-west, Gwynedd, Anglesey, Conwy, Denbighshire in the north and Ceredigion in the west. • The number of communities where more than 70% of the population was able to speak Welsh dropped to 54 according to the 2001 census, compared with 92 in 1991. It is argued that a high density of speakers is required for Welsh to be an everyday language of the community. • Migration has had a profound effect on traditional heartlands, with many Welsh-speaking young people moving to urban areas to work, coupled with the arrival of people unable to speak Welsh. A PETITION has been launched calling for Carmarthen’s local development plan (LDP) and others across Wales to be recalled over fears they are not based on local needs. A petition on the e-petitions section of the Welsh Assembly website urges the Welsh Government to recall all LDPs and scrap the use of statistics of population projections to shape the plan for each town. The petition closes in November and will then be discussed by a cross-party petitions panel. Carmarthen councillor and town sheriff Alun Lenny, who has signed the petition, said there is a serious situation facing west Carmarthen, with more than 1,200 homes planned between Johnstown and Travellers Rest, one of the biggest LDPs in the county. He said: “People in many parts of Wales are seriously concerned by LDPs, as they have the potential to damage the character of our communities by fuelling massive demographic change through migration. “Having said that, the situation has changed dramatically since these LDPs were drafted. “Very few people now move into Carmarthenshire. “There is a dire need among young people in the county for social housing and affordable homes. “Priority should be given to taking possession of long-term vacant properties in Carmarthen, for use as rented accommodation or starter homes. “The county council urgently needs to address the needs of our own people, rather than fuelling in-migration by covering green fields with over 1,000 houses. The authority said the county’s population is expected to increase by 11 per cent. Former town mayor and current north Wales AM Llyr Huws Gryffydd visited Johnstown last Tuesday to meet with Mr Lenny and local resident Arwyn Davies over the town’s LDP. Mr Huws Gryffudd, Plaid spokesman for rural affairs, said: “Carmarthen is facing a similar situation as many communities in north Wales where there are large scale plans for homes, which are based on population projections and housing need taken from as far back as the censuses in 1991 and 2001. The Welsh Assembly did not wish to comment on the petition until it closes in November.